Hinds-Bock Model 2P-64WP, dual piston filler / depositor with volume of product – depending on materials and application. Equipped with 30" long x 30" wide x 26" deep stainless steel product hopper, two 64oz pistons, with two 2" OD product positive cut-off nozzles both with sanitary fittings set on 16" centers, height adjustable column with current discharge height of 26" and mounted on 36" long x 32" wide, H style stainless steel base with casters and foot pedal controller. Hinds-Bockï¿½s 4P-12 automatic, stainless steel, 4 head, air operated piston filler with number of containers per minute – depending on materials and application. 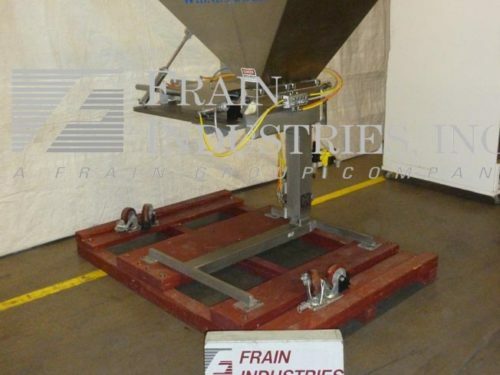 Size range: 0.1oz to 12 oz with proper change parts, Equipped with 46" long x 32" wide x 24" deep stainless steel product hopper (4) 2" ID x 7" long stainless steel air assist pistons, with rotary shut-off pneumatic package, e-stop. Mounted on H style base frame with casters. Hinds-Bock, Model 2P-64I, stainless steel, dual head piston filler / depositor. Rated to 64oz per piston. 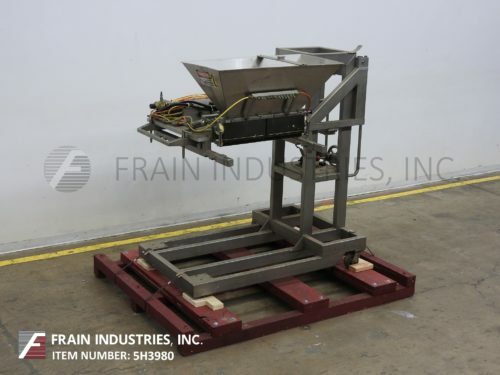 Equipped with 30" long x 18" wide x 27" deep (7.8 ft³) stainless steel product hopper with variable speed agitation, two 64 oz pistons, two 1½" OD positive cut-off nozzles set on 5" centers, height adjustable column with current discharge height of 36½". Mounted on H style stainless steel base frame with casters. Speed dependant on materials, application, machine configuration and operator dexterity.